." This week&apos;s winner is "Lazy Day, Garrapata State Park, Big Sur, CA" submitted by Michael Hartley. Can you envision yourself on this beach? Garrapata State Park in Big Sur is a treasure to those who have discovered it. 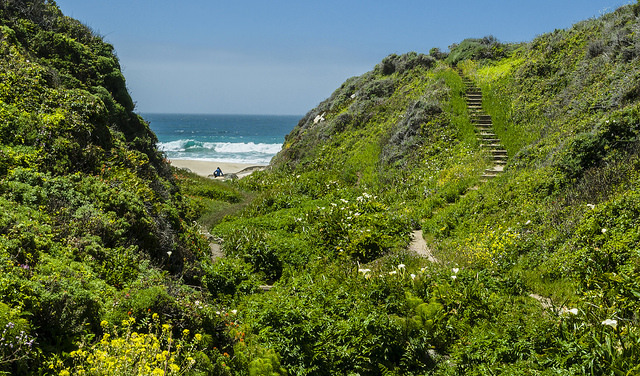 The park&apos;s unpopulated hiking trails provide access to both the beautiful Big Sur coastline and the breathtaking Santa Lucia Mountains and lie within a short drive of Carmel. From Rio Road in Carmel, drive 6.7 miles south and look out for the "Garrapata State Park" sign. The first numbered turnout is located immediately after that sign, with turnouts 2-19 following. If you pass a mile marker labeled "MON 63.00," you&apos;ve gone too far. From Big Sur, drive 18 miles north (slightly north of Rocky Point) and watch for mile marker "MON 63.00." Turnout 19 lies shortly thereafter.